As we were at this year’s Milwaukee Media Event, the company debuted the 9.0 Ah battery, which it dubbed “High Demand”. These Milwaukee 9.0 Ah batteries provide over twice the work of a 5.0 Ah battery because they can run cooler and with greater efficiency. To give you an idea of how this translates into a real world application, it can make 258 cuts of 2×10. For comparison, Hilti’s 36V circular saw did 173. If 2x4s are your mainstay, then realize that a single Milwaukee 9.0 Ah battery can make 537 of those cuts—that’s astronomical and likely a full day’s worth of work. In fact at the 2014 Milwaukee media event, they were bragging about the new Milwaukee FUEL M18 circular saw making 233 cuts of 2×4. The times; they are a-changin’. If you ant to know the math, the Milwaukee 9.0 Ah High Demand battery delivers 162 Wh (Watt-hours) or energy. That’s 80% more than the 90 Wh available on their 5.0 Ah battery pack. On a battery platform, more watt hours means you get more run time. It can also potentially mean you get access to more power. 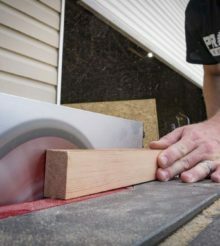 The Milwaukee 9.0 Ah battery will let you make an astounding 258 consecutive cuts into 2×10 lumber. As an aside, we found it pretty interesting that the results of our cordless circular saw shootout numbers matched up to within 5% of the numbers Milwaukee used at their event to display the run-time and cutting capacity of various manufacturers’ competing products. If you ever wondered whether manufacturers tend to “stack the deck”, our experience has been that most (not all!) are quite reasonable and fair in their general claims. So how do you get over twice the work of a 5.0 Ah battery out of a 9.0 Ah pack? First you have to understand energy flow. The Milwaukee 9.0 Ah batteries are more efficient thanks to wide channels which feed voltage across the cells. They also run cooler. A cooler pack can accomplish more work because it doesn’t have to worry about overheating as easily. Milwaukee designed the RedLithium High Demand 9.0 Ah battery pack to have 5 cells in three staggered rows, distributing the power in such a way as to keep the pack compact—it’s only a little larger than a 4.0 or 5.0 Ah pack. They also retain all the features of current Milwaukee M18 RedLithium batteries like shock absorption, temperature control, RedLink electronics and protection against water incursion. Notice the staggered cell layout inside the Milwaukee 9.0 Ah battery pack. This is how Milwaukee was able to get the pack to be only slightly taller than existing RedLithium XC packs. I knew the future of tools lay with cordless technology, but I hadn’t thought we’d get quite this far this quickly. With the Milwaukee High Demand 9.0 Ah RedLithium battery, you get new possibilities. Those new possibilities include cordless SDS Max hammer drills, all-day run-time, cordless saws that compete with corded models—and probably a lot of things we haven’t thought of just yet. You’re not going to want to run these batteries on tools that don’t need them—there’s no need to add the additional weight (which is measured in ounces, but still). Milwaukee 9.0 Ah batteries are for high demand tools and applications where you really need to squeeze out the most power or runtime possible from a cordless tool.